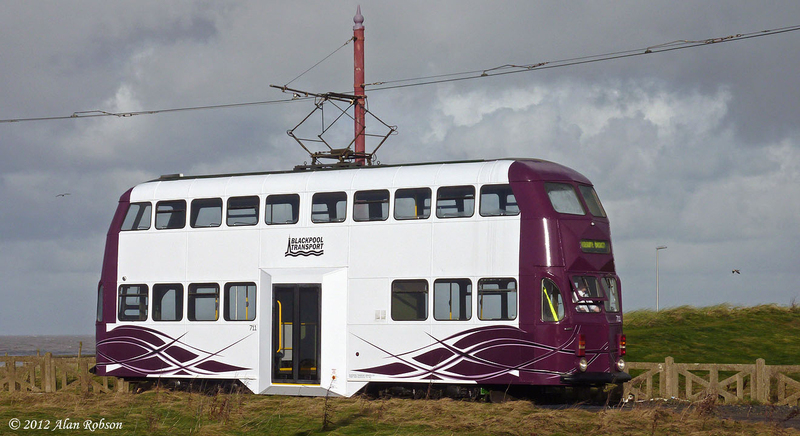 In a surprise move, Centenary 643 has left its home of the last two years for pastures new. 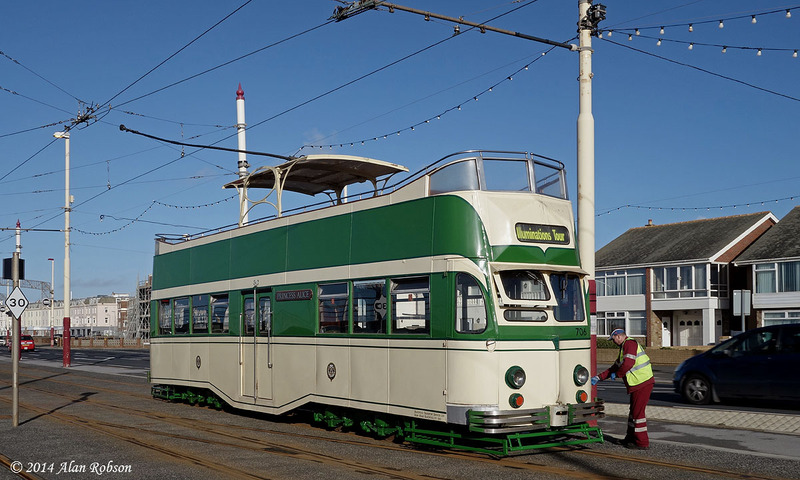 643 was originally transported to Broadwater Caravan Park in Fleetwood on 13th January 2012, today saw the tram removed by Scotts Heavy Haulage due to the park no longer having any requirement for it, despite having converted the interior into a cafe and repainted the outside of the tram into a pleasing green and cream colour scheme, reminiscent of the Coronation Cars. 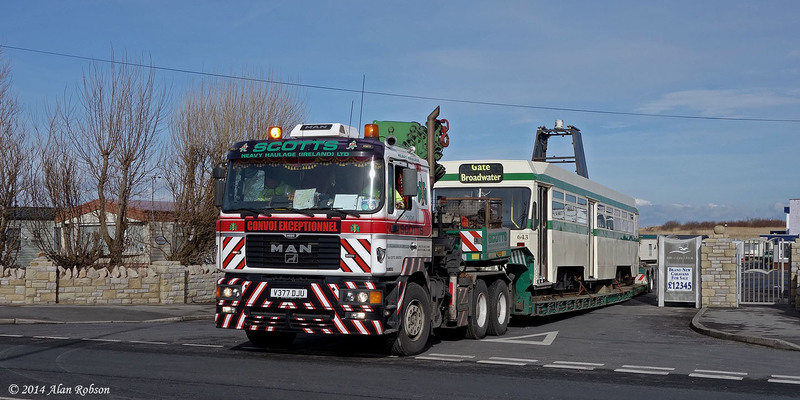 643 left the caravan park on the back of Scotts low loader on the afternoon of 28th February. 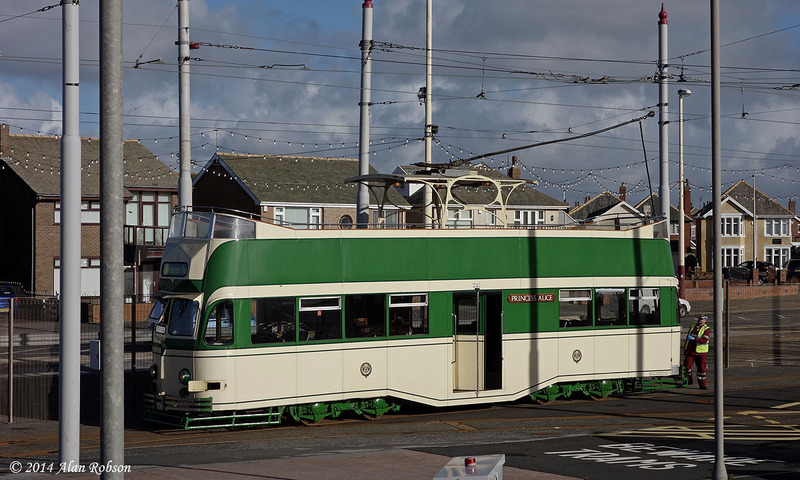 A former Blackpool Corporation 1959 Leyland PD2/27 with a Metropolitan-Cammell FH35/24R body made a return to the resort today. 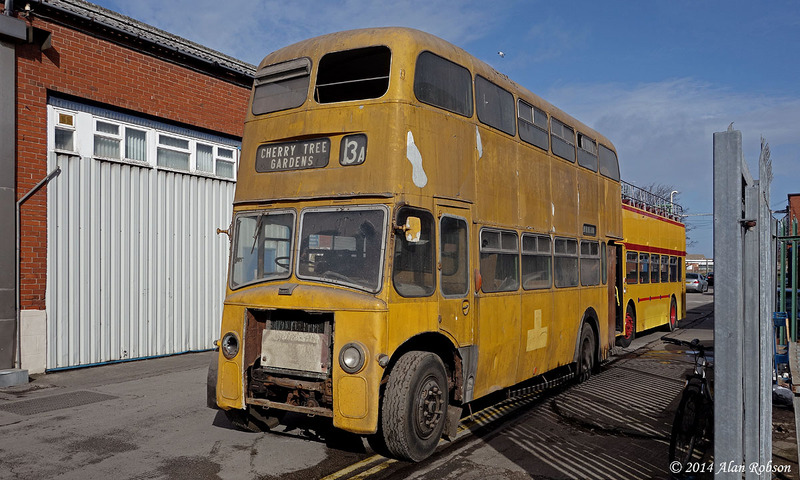 Blackpool 346 (PFR 346) has been part of the collection of buses owned by the Lancastrian Transport Trust for several years, latterly the bus has been stored at the LTT premises in Weeton village. 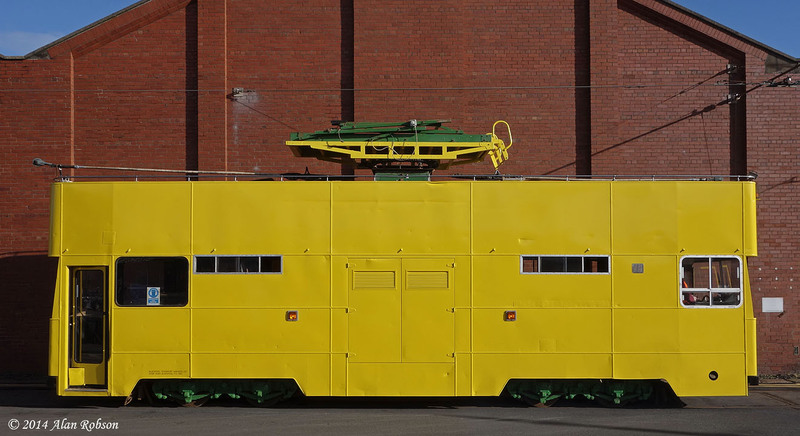 346 survived in operation in Blackpool until 1975, at which point it was transferred to the Illuminations Department as a mobile mess room. 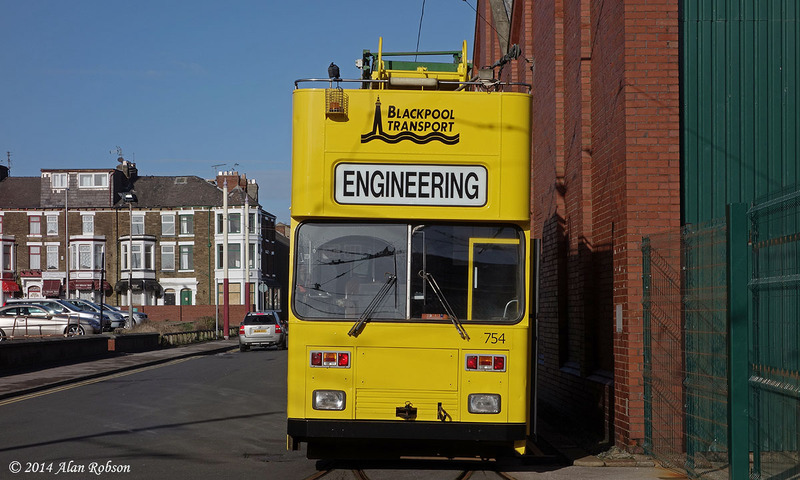 The bus was sold for preservation in 1985, after three years of storage out of use, initially being owned by the North West Museum of Transport, the vehicle became surplus to their requirements in 2005 and was sold to the LTT. 346 was towed to Brinwell Road in Marton on 27th February, and was noted parked outside the premises of Oakwood Travel. 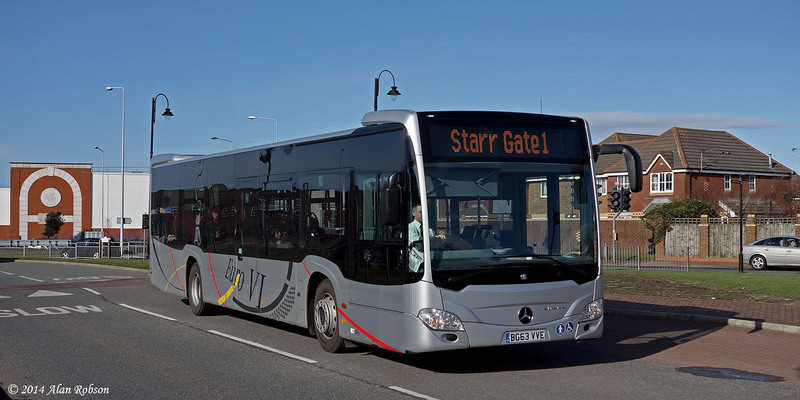 Mercedes-Benz Citaro MAL53 (BL52ODK) is back in service again on the Catch 22 route. 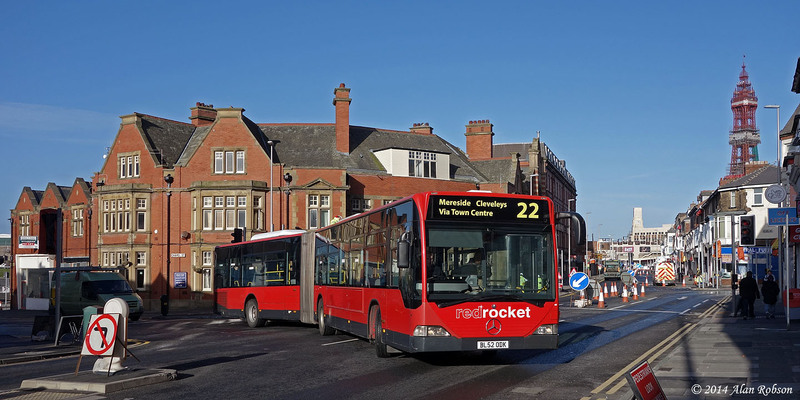 The Citaro was initially trialled in passenger service on the 22 route back on 20th January, but has been off the road in the interim having a few problems resolved. 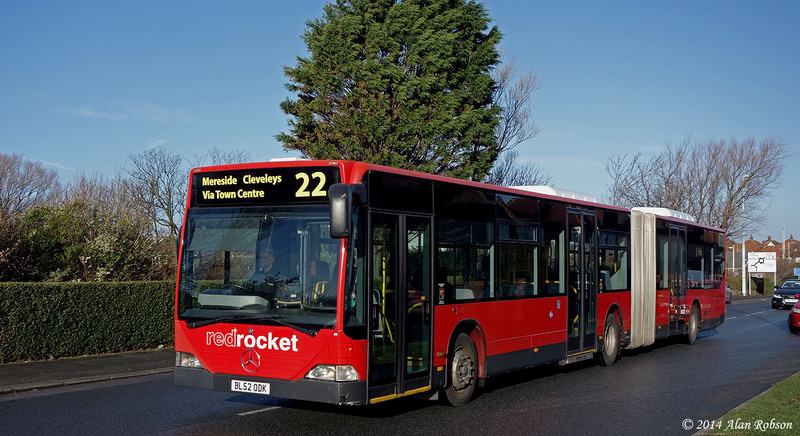 The bus has now been fitted with vinyl lettering over the destination box which reads "Mereside Cleveleys Via Town Centre 22". 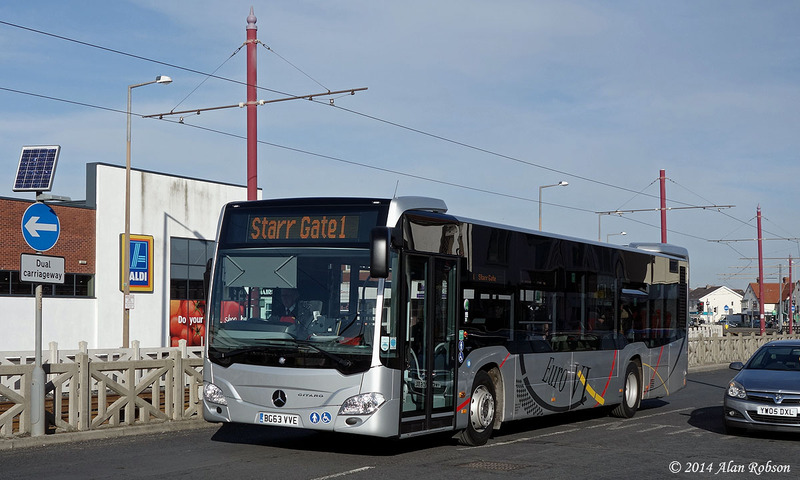 The Mercedes-Benz Citaro Euro VI demonstrator that is currently on trial with Blackpool Transport is now in its third week of use with the operator. 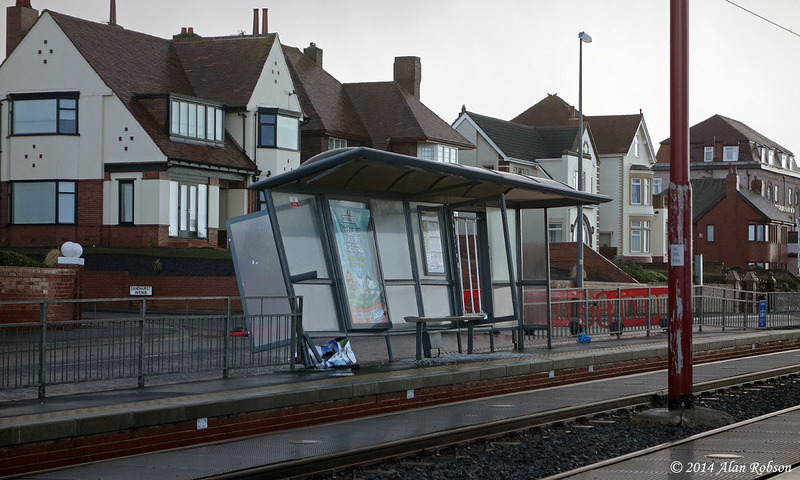 BG63VVE has been working on the service 1 route along the Promenade since 10th February, the bus was noted at the route's northern terminus at Freeport in Fleetwood on 24th February. 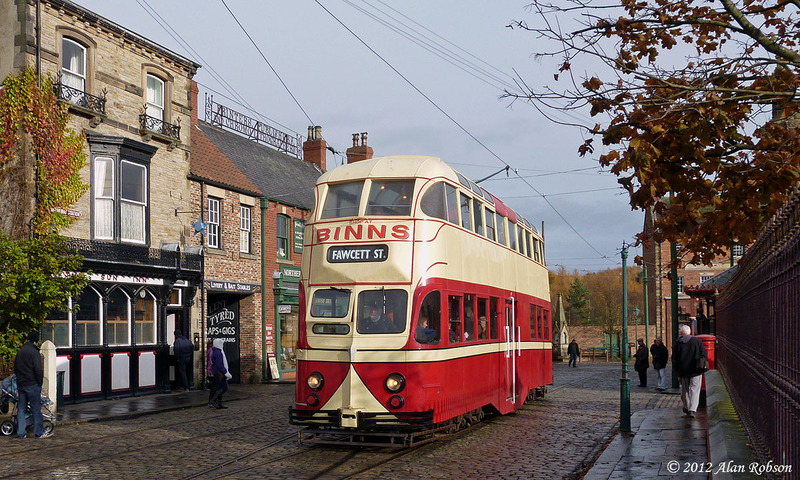 Balloon 703 (masquerading as Sunderland 101) has been on loan to Beamish Museum from the Lancastrian Transport Trust since September 2010. 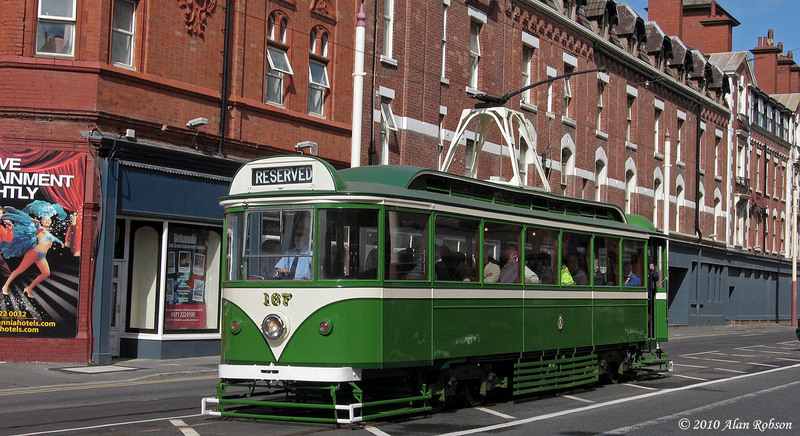 The tram was painted into Sunderland red and cream livery prior to its move north, inspired by Sunderland English Electric built centre entrance car 99, which resembled a less streamlined version of a Blackpool Balloon in appearance. 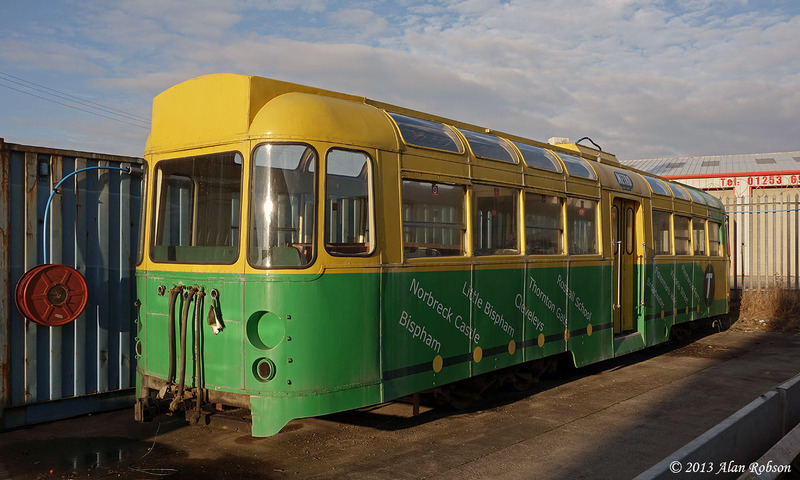 Beamish have now announced that they have concluded a deal to purchase 703 from the LTT, thus ensuring its long term future at the museum as part of their well maintained collection of trams. 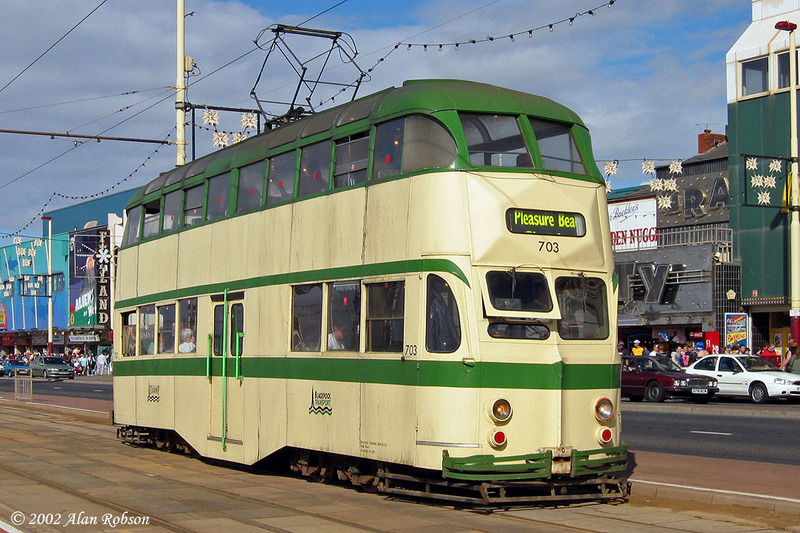 There is now a possibility that 703 will at some point in the future revert to its former twin destination display layout, in order that the tram more closely resemble its predecessor Sunderland 99. 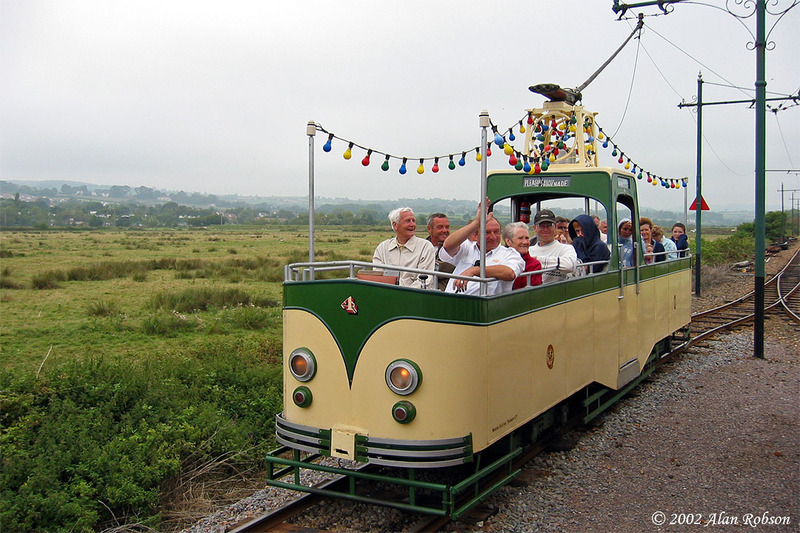 The Seaton narrow gauge tramway in Devon has become one of the latest casualties of the stormy weather which has swept across the country over the last few weeks. The tramway runs right alongside the estuary of the River Axe for nearly a mile, and has suffered major damage to its infrastructure, with the trackbed and ballast being washed away for about half a mile and overhead poles uprooted due to the soil being completely washed away from their concrete foundations. The Riverside Depot also suffered from flooding, but the most serious damage is that which has been done to the track and overhead poles. 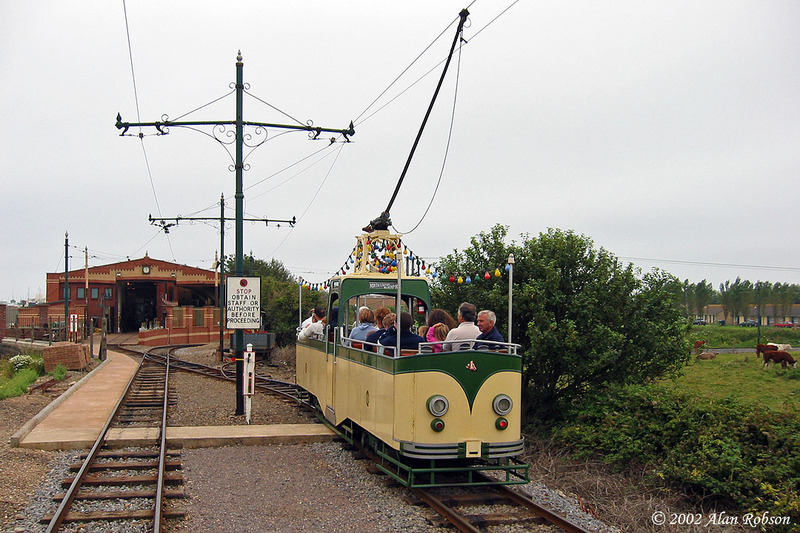 The tramway are planning to run a reduced service between Colyford and Colyton until the trackbed southwards to Seaton can be rebuilt. 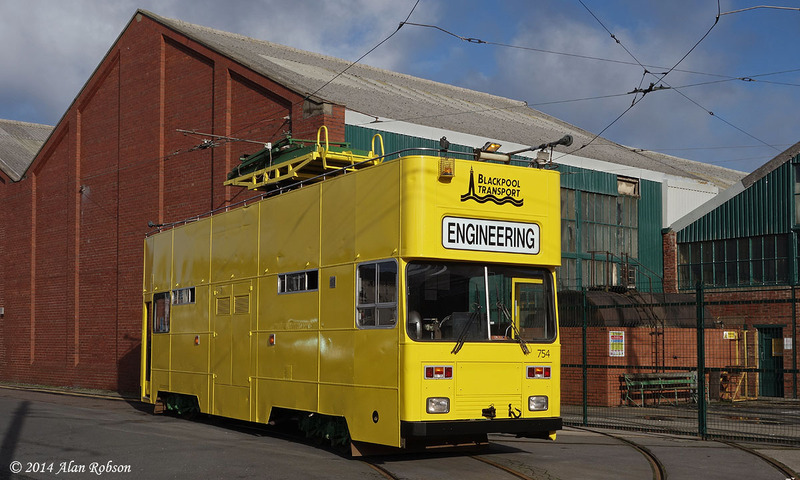 Twin-Set Trailer Towing car 671, formerly part of the Lancastrian Transport Trust collection, is being acquired by a new preservation group called the Tyne Tees Transport Trust (TTTT), in a deal brokered between themselves, the LTT and the North Eastern Electrical Traction Trust (NEETT). 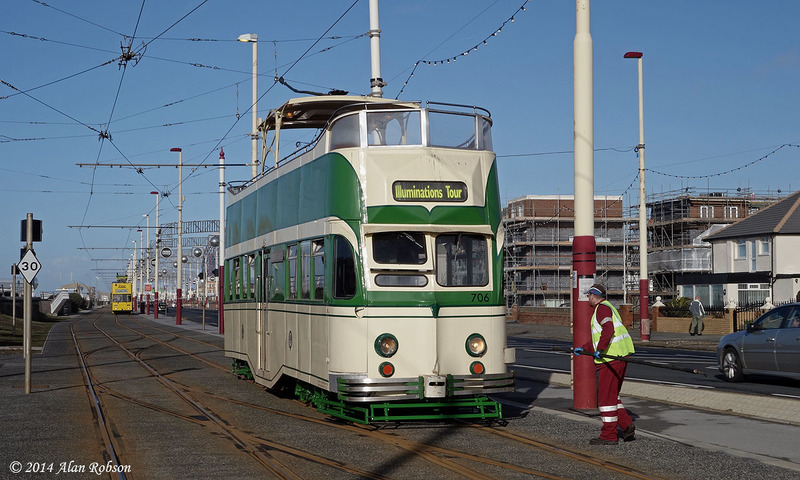 The tram will initially be transported to Rigby Road where work is planned to be undertaken on it, before 671 moves on to its new home. The Fylde Coast was in the Met Office red alert zone during the afternoon and evening of the 12th February, due to being in the path of a severe storm that was moving up the west coast of the country. 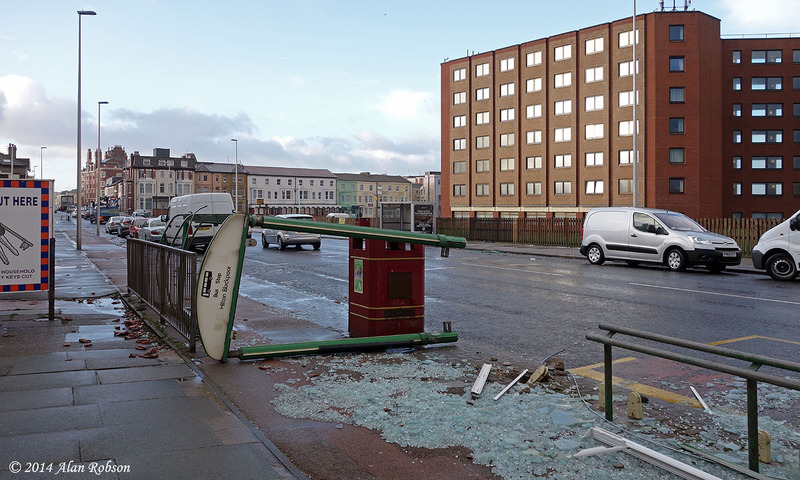 90mph winds tore into the Fylde Coast during the evening, causing havoc and destruction, with many brick walls, trees, windows and roofs being damaged or destroyed by the ferocity of the wind. 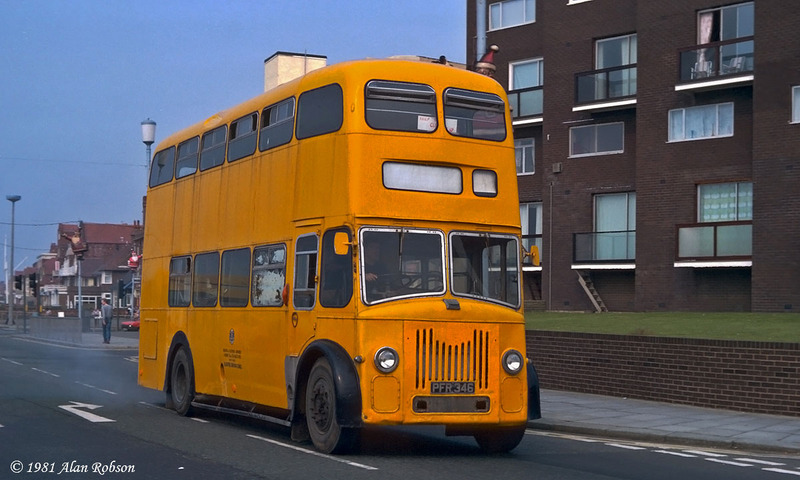 Blackpool Transport were not immune to the weather, during the height of the storm in the evening all bus and tram services were suspended. 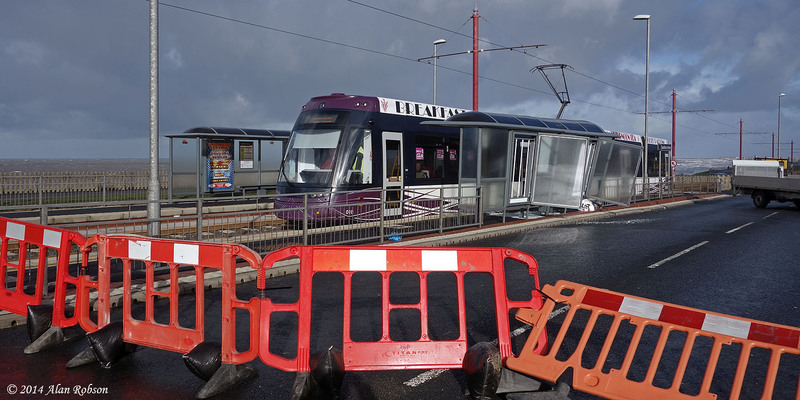 At least two passenger shelters were severely damaged, a bus stop on Dickson Road behind the Hilton Hotel was totally destroyed, and one of the new tram shelters at Sandhurst Avenue on top of the cliffs was uprooted by the gales, causing the promenade to be closed to all road traffic in both directions the following day. 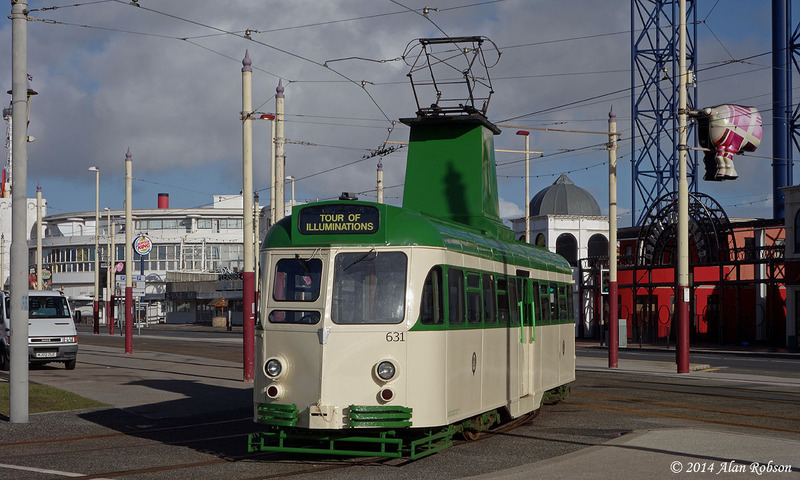 Blackpool Transport and the National Tramway Museum have agreed on a tramcar exchange for 2014. 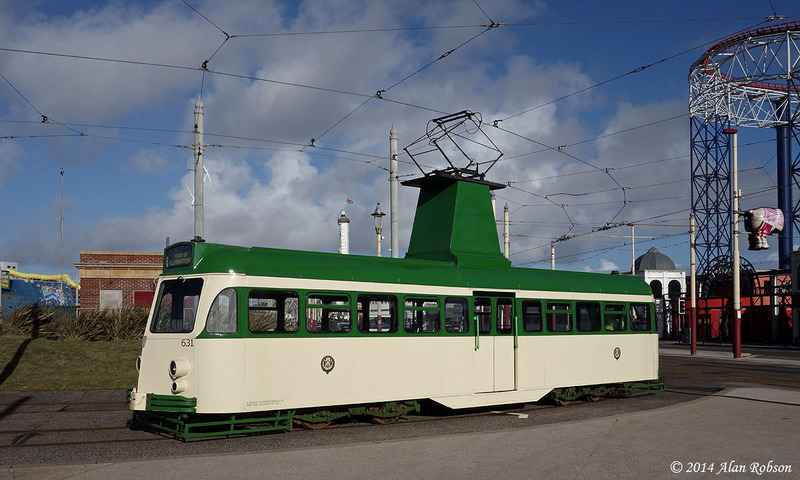 Pantograph car 167, which is currently on loan to The Living Museum of the North at Beamish, is to be transported to Blackpool in April in time to enter service over the bank holiday weekend of 25th May. In return modernised purple Balloon 711 will be moved to Crich and operate there during 2014 in order to take the place of 167. Only one other Blackpool Balloon has ever operated in service at Crich, and that was 710 which was part of an exchange during the 1980s. 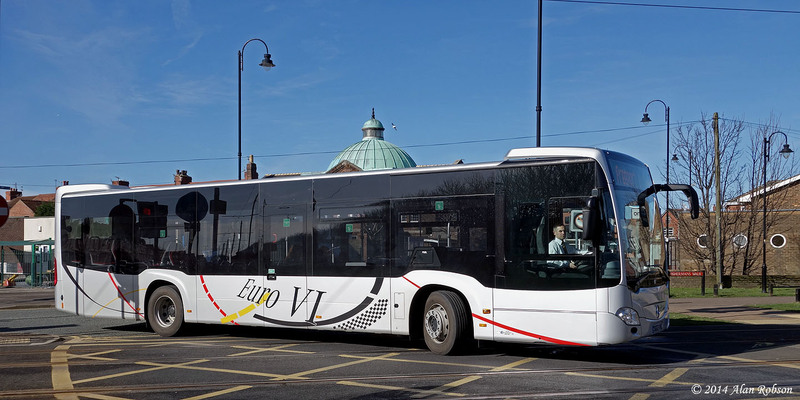 Blackpool Transport currently have a new Mercedes-Benz Citaro Euro VI demonstrator on trial. 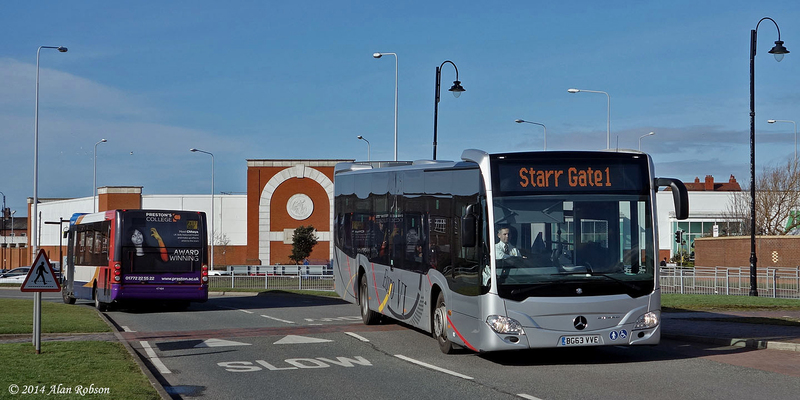 Citaro BG63VVE was noted operating on the Starr Gate to Fleetwood service 1 on 10th February. The vehicle is painted overall silver, with black, yellow and red graphics on the sides. 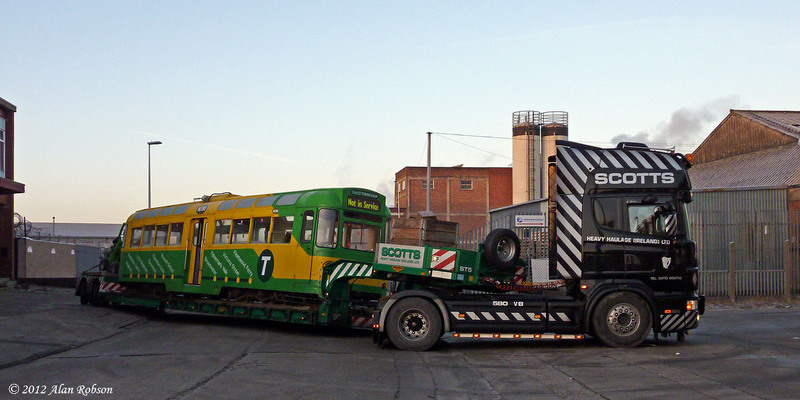 Following Brush Car 631's visit to Starr Gate depot on 31st January, it returned back to Rigby Road depot on 7th February. Open-top Balloon 706 "Princess Alice" made the reverse journey on the same day, taking the place of Brush Car 631 at Starr Gate depot. 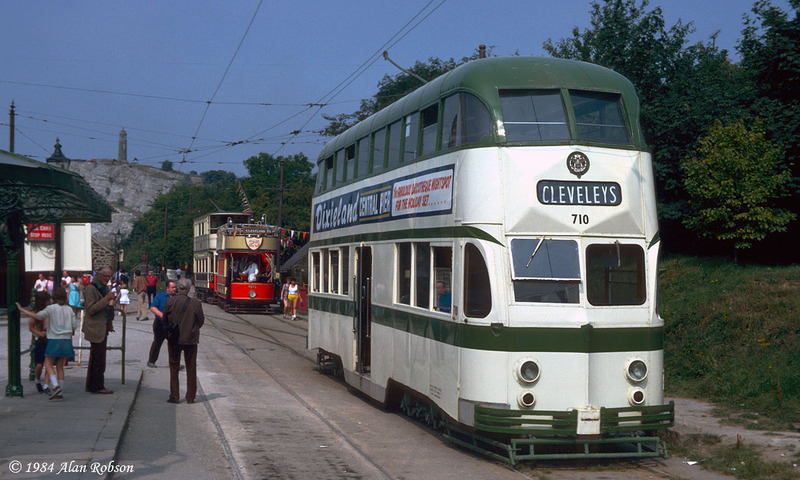 706 was followed by Engineering Car 754 on the way to Starr Gate, both trams being stabled in the running side of the depot. 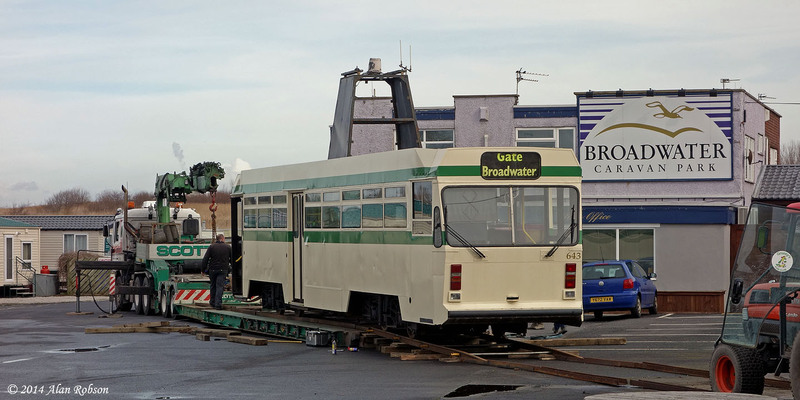 It is only seven days ago that 754 made the move from Starr Gate back to Rigby Road, it's not known how long both trams are going to stay in Starr Gate depot. 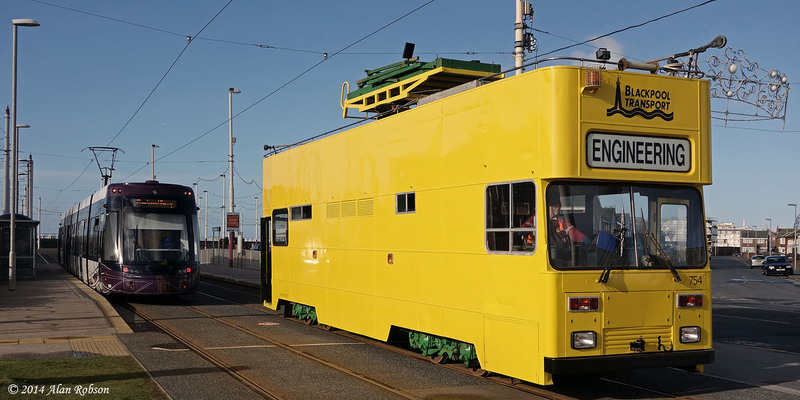 Recently repainted Engineering car 754 was parked in Blundell Street in the sunshine on Friday 7th February, affording the chance to get some decent shots of the tram since it received its first repaint late last year in a new lighter shade of yellow. Archway Travel's Dennis Dart MPD X503WRG was noted at Preston Bus Station this morning. 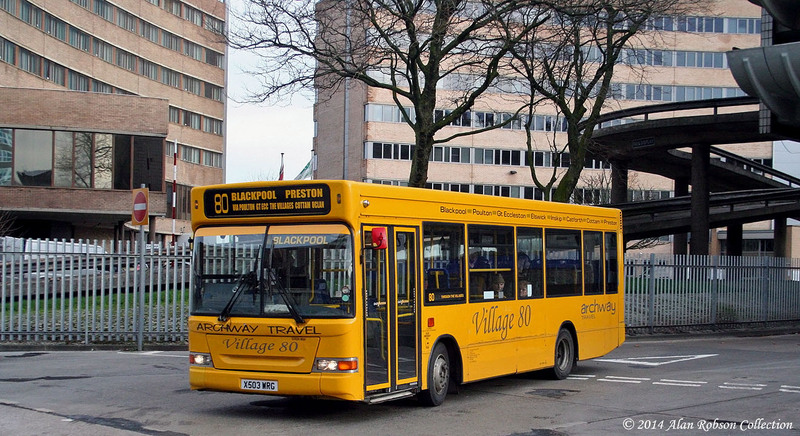 The previous destination display of "Through the Villages" has been replaced with "Blackpool Preston via Poulton Gt Ecc The Villages Cottam UCLan", the vehicle has also been fitted with a yellow sun visor strip across the top of the windscreen. The wooden destination board has also been repositioned from on top of the dash panel to the top left-hand side of the windscreen.